The largest portion of the equine diet should be composed of roughage such as grass, hay, lucerne or silage. Equine physiology is designed for eating bits of roughage throughout the day and sufficient roughage is essential for good digestion. An optimum diet would consist of at least 60% roughage. A horse that is worked out regularly is not likely to end up with “hay belly.” Therefore, always provide enough roughage in the diet. The guideline is to give him 1 – 1.5 kg of roughage per 100 kg of body weight each day. Since concentrated feeds are more and more often composed specifically for each breed and type of horse, it is important to know what nutritional components like vitamins, minerals and trace elements are contained in a horse’s roughage. This will enable proper coordination with concentrated feeds in order to meet a horse’s needs completely. At Hartog, we can offer your horse or pony a completely balanced diet with a range of horsefeeds that complement one another perfectly. 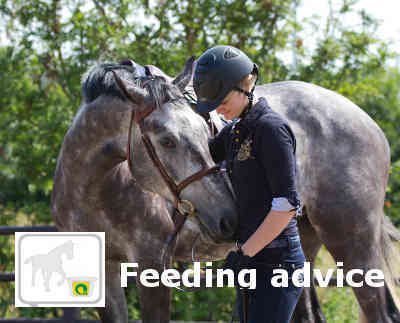 It's also possible to calculate a feed ration for your horse or pony with Hartog Feeding advice.